Antarctic krill, Euphausia superba, is the largest krill species. 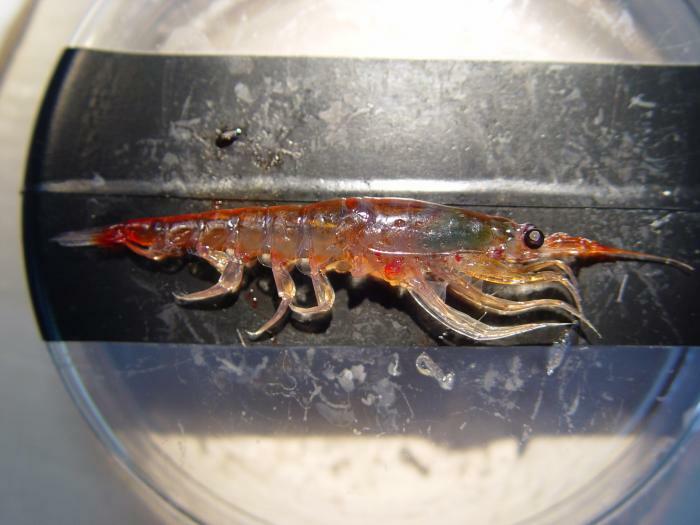 Shrimplike marine invertebrates that grow no bigger than about two and one-half inches (6 cm), krill are nonetheless food for gigantic baleen whales, along with penguins, seals, fish, sea birds, and many other predators. It may seem unlikely that 80-ton whales can be sustained by these small crustaceans, but the whales consume them by the ton—which says a lot about the numbers and concentrations in which krill are found. Krill gather into dense swarms that can have from 1,000 to 100,000 individuals per cubic yard (1 cubic meter), and a swarm can extend from 30 feet (10 meters) to almost 4 miles (6 km) in length. Krill play a critical role in a variety of marine food webs, especially those in the polar regions. Many krill species themselves feed primarily on phytoplankton, organisms that use sunlight to synthesize their own food. In the light-filled summers of the sub-Arctic and Antarctic, there are huge blooms of phytoplankton for the krill to feed on, so there are immense swarms of krill—just when hungry penguins and migrating baleen whales need them. In terms of biomass, krill are one of the most successful species on the planet– with a total estimated mass of approximately 500 million tonnes. Antarctic krill have a special relationship with sea ice, which is both shelter and dining hall for larval and juvenile krill in the winter. That’s because the ice serves as habitat for algae. These ice algae live on and inside the ice and can give the floating ice a brown or greenish hue. 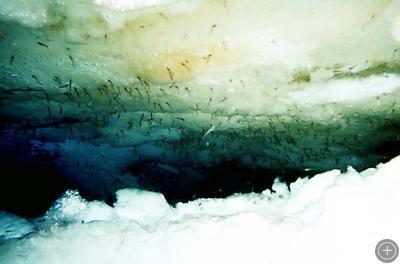 This image, taken by a remote operated underwater vehicle (or ROV), shows how most krill feed by swimming upside-down directly under the ice, grazing as they go. A single krill can clear one square foot of ice algae in approximately 10 minutes. But the sea ice is shrinking in both winter and summer. This is especially pronounced in the Southern Ocean adjacent to the western Antarctica Peninsula, where there’s been a considerable increase in atmospheric and sea surface temperature. The krill population in this region has decreased by about 80% since the mid-1970s, according to several experts. Experts also think that the warmer temperatures and the loss of sea ice are at least partly to blame. Climate change is not the only thing impacting the health of the krill population, however. During the 1970s, commercial krill fishing in Antarctic waters began expanding rapidly. Initially, the krill were used mostly for pet food and fertilizer, but more recently they’re being used for nutritional products such as omega-3 fatty acid supplements, feed for the rapidly growing aquaculture industry, and even in some new cosmetics. 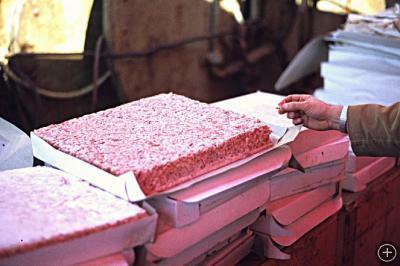 Deep-frozen plates of krill meat destined for animals and humans alike. 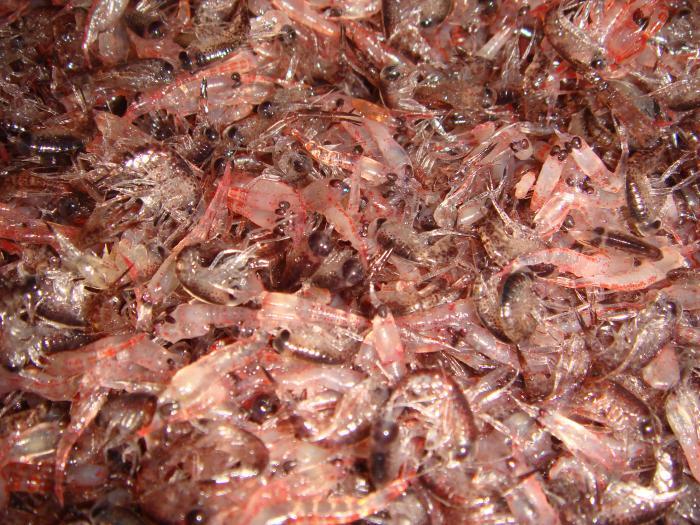 While nearly 100% of Canadian-caught krill becomes fish food, about 43% of Japanese-caught krill is targeted for human consumption as meat, pastes, or additives. Krill fishing is managed by the Commission for the Conservation of Antarctic Marine Living Resources (CCAMLR), which sets catch limits. At the CCAMLR 2007 annual meeting, the commission increased the yearly allowable catch in some areas, including the coastal area of Eastern Antarctica. But they also put into place some new requirements. Now, all krill fishing vessels in the region must participate in the CCAMLR vessel monitoring system, and vessels fishing in the Eastern Antarctica area need to have observers on board. In addition, once certain catch levels have been reached, CCAMLR will introduce other measures in order to protect the animals that feed on krill. Humpbacks, minkes, and orcas are often sighted in the nutrient-rich Antarctic waters. Living along the continental coastline are the emperors and the Adélies. 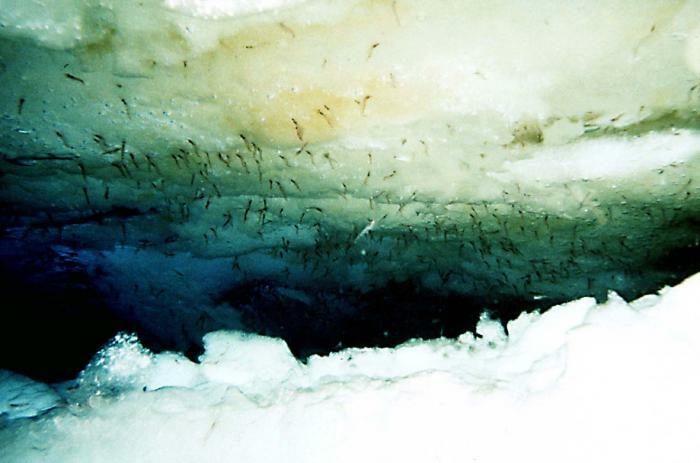 The Antarctic food web is the simplest on the planet, and krill are at its hub.